In not much more than a generation, we have transitioned from a world in which infectious diseases were the greatest health challenge to one in which multiple chronic illnesses and disability are the biggest threat. The implications for our health systems are massive, but not only are they alarmingly ill equipped to cope; we are facing a frightening lack of evidence on how they need to be adapted. If we don’t address this evidence gap — and quickly — we cannot hope to create health systems capable of delivering the comprehensive care patients so desperately need. Populations are ageing; between 2015 and 2050, the proportion of people aged over 60 is projected to almost double, reaching around 2.1 billion. As a result, many more people are experiencing several diseases simultaneously — a phenomenon known as multimorbidity. In Australia a quarter of the population live with more than one long-term illness and around 15 per cent experience three or more chronic conditions. Most of our understanding of multimorbidity comes from high-income countries, where in primary care it is the norm rather than the exception. The number of people affected rapidly increases after the age of 65, but also disproportionately affects the poor and vulnerable. The financial costs associated with this are enormous; approximately 70% of healthcare spending in the United States is on people with two or more chronic conditions. Similar trends are likely to be occurring in low and middle-income countries. In a snapshot study of Ghana, Mexico and four other countries, around 50% of people aged over 60 had two or more chronic conditions. But unique to these countries is the fact that these changes are occurring in the context of an existing burden of infectious diseases, maternal and child health problems and nutritional conditions, placing additional strain on already fragile or emerging health systems. 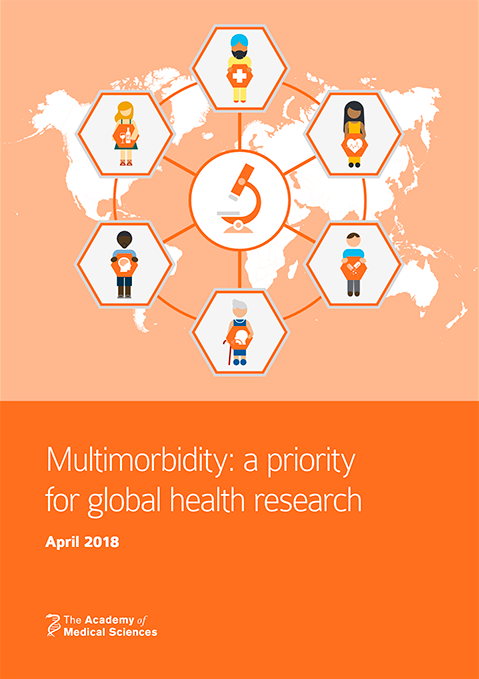 It’s clear that multimorbidity is not simply a problem for developed economies — it’s a huge and pressing global health problem. Despite the scale and urgency of this global problem, we lack reliable data — particularly when it comes to younger adults and developing countries. We don’t know why different conditions seem to ‘cluster’ together in patients; some of them share common risk factors, but others appear unrelated and even require discordant treatments. What is the burden of different clusters? What is their relative impact on disability and quality of life? And what are the modifiable risk factors for these clusters occurring? Not only this, but research that guides healthcare often excludes people with multiple chronic conditions, potentially limiting its applicability to an ever-diminishing number of people. We need to confront this tension between increasing complexity and sub-specialization with our patients’ need for a more holistic approach. We need a radical rethink of our health systems. But we can’t redesign systems if we don’t fully understand the problem in the first place. The only way to change is through a deeper understanding of the phenomenon we’re facing — something we will only achieve through a concerted effort by researchers, funding bodies and governments. · Exploring strategies to best manage patients with multimorbidity, including how health systems can be reorganized to facilitate this. In low- and middle-income countries, we have an opportunity to avoid excessive sub-specialization, and design systems better structured to deal with multimorbidity. One example could be integrated chronic disease clinics for commonly occurring combinations of conditions such as diabetes and tuberculosis. These clinics would also provide an opportunity to screen for other common chronic diseases. Understanding our patients’ perspectives, as well as those of healthcare providers, will be crucial; particularly because multimorbidity increases the demands of care, while reducing individuals’ capacity to manage their care themselves. With better insight into the complex interactions between different chronic conditions, we could design systems that capitalize on opportunities to provide care for coexisting conditions. Only by gaining a real understanding of the causes and consequences of the tidal wave of multimorbidity that confronts us will we be able to respond effectively and transition to more people-centred health systems, characterised by high-value, integrated, and generalist care. Professor Stephen MacMahon is Principal Director of The George Institute for Global Health and Professor of Global Health and an Oxford Martin Senior Fellow at the University of Oxford. He is also Chair of the Academy of Medical Sciences multimorbidity working group. Dr Brendon Neuen is a Medical Registrar at Royal Prince Alfred Hospital, Australia and PhD Scholar at The George Institute for Global Health. Want to read more? Try our articles on Telephone triage: the scale-up of innovations must have a robust evidence base, a mindful approach to the year, medical trials and developments in healthcare.